Show your precious little ones how much you love them... with every bedtime prayer. Everyone loves a sweet bedtime story  and this one has the added bonus of teaching children a lifestyle of healthy prayer. 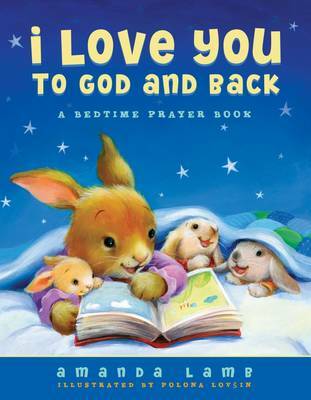 Starting with sweet and silly text about bedtime routines  teeth brushing, story time, and one more glass of water  this delightful book will then teach children how to pray: love God, ask Him for forgiveness, thank Him for many blessings and offer requests. Throughout the bedtime rituals, Mummy and Baby giggle as they play a game to describe how much they love each other. This unique story will make bedtime prayers a real learning and bonding experience for parents and children. This complement to Amandas beautiful book for grown-ups is a perfect bedtime book for parents and children. I Love You To God And Back by Amanda Lamb was published by Thomas Nelson in February 2013 and is our 15535th best seller. The ISBN for I Love You To God And Back is 9781400320820. Be the first to review I Love You To God And Back! Got a question? No problem! Just click here to ask us about I Love You To God And Back.